Viggo Boesen was trained as an architect and in the 1930’s he made the funkis style popular among a wider audience by introducing a new villa type in Denmark. His philosophy was furniture design with an organic flow that embraces the body smoothly and tenderly, is a delight to the eye as well as solid and durable. 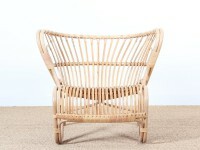 Inspired by a design competition held by the Danish wicker-maker guild in 1936, Viggo Boesen embarked on rattan furniture design combining modernist style with the hard wear qualities of the rattan material. Viggo Boesen’s FOX lounge chair won the design competition in 1936. His inspiring, imaginative designs made him unique and put him among the designers of the “Danish golden age”.